I wanted to stop by and share with you an interesting experience I had at the Field Museum two Wednesdays ago. As part of my internship, my fellow interns and I along with are supervisors have a weekly meeting on Wednesdays. After our meeting on the 10th, all of us interns came away with are weekly assignments and focus for the rest of the week. That is when one of our supervisors told us that a group of high school students would be meeting with staff of the anthropology department and the meeting would take place at the Maori House (formally Maori Meeting House, Ruatepupuke II). The students were in a program that was for teens from Bronzeville and Pilsen which are African American and Mexican American neighborhoods, respectively. 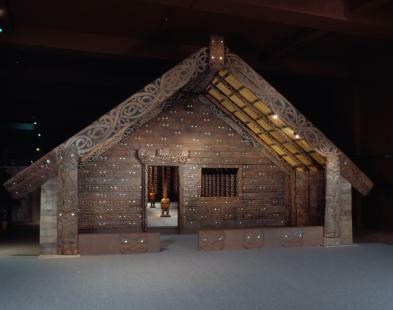 The Maori House is an permanent exhibit at the Field Museum near the museum’s south Pacific exhibition. The Maori from New Zealand, whom this meeting house formerly belongs to, allowed the museum to keep it even though the meeting house is a place of great importance to their heritage. The place is representative of their honored ancestors, one of which is Ruatepupuke. Our supervisor said that using the Maori House as a gathering place was a part of the agreement made with Maori. This is when we found out that there would be a ceremony held at the Maori House and there would be singing. He did mention that while the ceremony is similar to the ritual that Maori used when new people came into their territory, we were not at all suppose to be pretending to be Maori. Suddenly our internship turned into choir practice as we worked on a song to offer to our visitors (“Simple Gifts” a Shaker hymn, an interesting choice). When the time came to meet at the Maori House, all of the interns realized how serious this ceremony was. Another anthropologist (who expertise is definitely in this area) led us in what to do, where to stand, and what not to do. We also found out that the high school group had prepared for the ceremony in return. At the end of the ceremony everyone joined together and we processed through the Maori House, solemnly touching each carving inside the meeting house which represented an ancestor. When I made it half way around the house, suddenly a loud chant broke out. There were two visitors to the museum at the house entryway. We found out that the couple was from New Zealand and that man who was chanting just happened to know a Maori blessing. What turned out to be a little silly to me and other interns ended up being a meaningful gesture between the museum staff and the high school students. After the ceremony we went outside and shared snacks. It was a good time to hear what the teens were experiencing that summer. Unfortunately, we never learned the name of the program they were in but nevertheless it turned out to be a learning experience for everyone.